Hopefully Mercedes #2 doesn't take Ferrari #1 out at the start of the race. I'm somewhat surprised Ferrari wasn't again accused of using 'interesting tactics'. Like the crack team of ninja Seb and ninja Kimi , led by sensei Arrivabene , snuck into Merc's garage and sabotaged Ham's car before Niki Lauda managed to fight them off using a broken off broom handle and a couple of frozen fish , saving Bot's car. That said , I hope Kimi jumps Bot at the start and both he and Seb leave the merc so far behind that he'll need a telescope too see our cars. Whatever it is that Ferrari has done , I hope that they do it again come next upgrade and that the guys who do it receive a tropical island each and anything else they want so we don't lose them. Great quali from both Seb and Kimi but I find the reaction to HAM's qualifying issues quite childish, we'd be gutted if it was one of our cars. I'm glad HAM's luck has taken a turn for the worse but we must remember that being too thrilled by other driver's misfortune can come back to bite us. We must not get too over-confident despite having our best chance of success for years. Let's hope it continues. I'm usually skeptical about stories of magical boost, but maybe there's some truth somewhere to these rumors. I'm not sure what can be done to have such huge improvement without actually upgrading the engine design. Maybe the performance was there all the while, but we were more conservative due to reliability concerns? Wish there was a strong man ruling the FIA who would immediately straighten Hamilton and Mercedes up. I have nothing personally about Todt, he led Ferrari to great success but he is pleased to stay complacent just to be in power. Mercs somehow the fastest in s3 even quicker than RB!! its insane how they got the downforce sections so nailed down, last year that was there weakest. Rosberg stated that Hamilton might've caused the hydraulics problems himself by going too wide and hitting something. By the way. Have you noticed the Pirelli tarmac ad that says "Pirelli Color Edition"? It shows the medium, soft and super soft (red) tyre although Pirelli brought the ultra softs here. Mistake or is it always like that? No, those are tyres you can buy for your car, it's a color edition for the streets. You can get them in those colors. Since when has the hamster ever given a monkeys about anyone else on the track. Actually he once was quoted referring to "Monkeys at the back" hoping they didnt get in the way of him driving through the field. Sporting he isnt Conceited sums him up nicely. Every time you see negative side of the things. Just cool down. Bottas was using more wing in order to protect the tyres from tyre deg for tmrw’s race. Ferrari or atleast kimi using less wing for more top speed. Same carries to vettel. 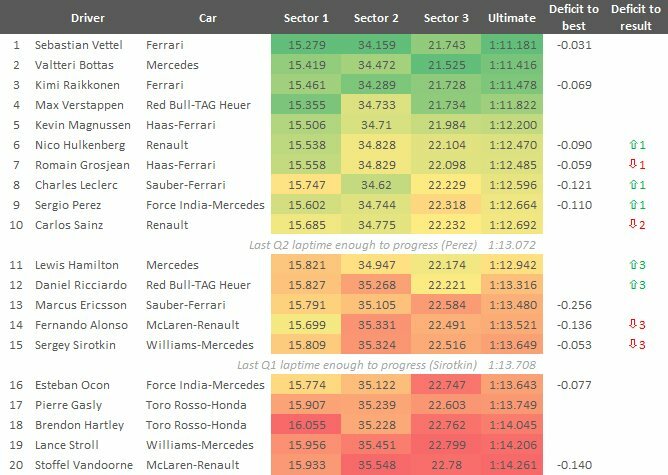 Budapest could be all about Ferrari vs Mercedes, both teams have improved a lot in slow corners since Monaco. Ricciardo expecting a win there, could be relegated to third row and 6th place. It doesnt matter how fast or slower n what sectors, ts about hooking up the whole lap. 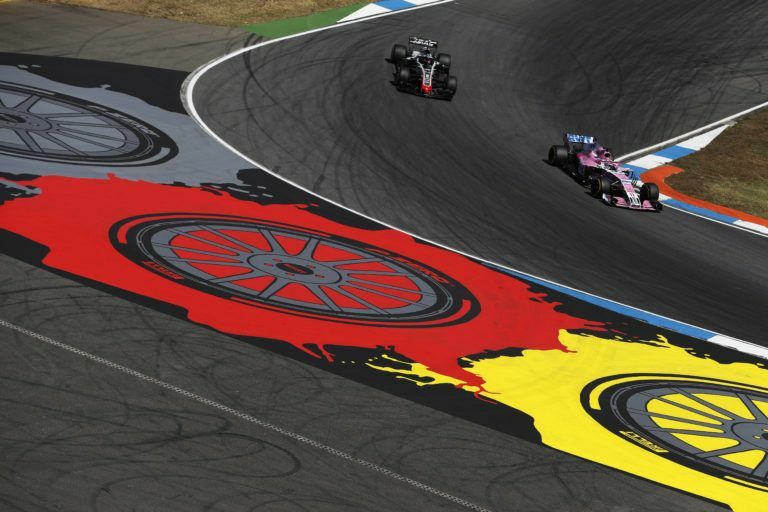 Hockenheim, July 21 – Scuderia Ferrari qualified in pole position for tomorrow’s German Grand Prix, courtesy of Sebastian Vettel. His team-mate Kimi Raikkonen will start the race from P3. Seb: “You always try to do your best every day. Today has been one of those days, the car was fantastic. I could feel it in Q1 already and then in Q3 I knew I could get a good lap. Racing here in Germany means a lot to me and hopefully we can get first place tomorrow. We built a strong car and we know there’s still potential. Also, we know we can still improve race by race, because there’s still some weaknesses, but overall we are competitive and strong. So, it’s up to us to make good use of this potential everywhere we go”. Kimi: “Today the car was working well and in qualifying I knew there was a lot of lap time in it. On my first try in Q3 I had a good feeling and the lap was looking good, but then I made a mistake and got sideways. We had the speed to do better, but I did not want to make any crazy mistake and risk throwing everything away, so on my last try I took it a little bit easier. Third position is obviously not ideal, but in the end it is a pretty good position to start from. It’s difficult to say what will be the key to the race. So far our car has been good and I expect it to be the same tomorrow, but the conditions might change. As for every race we’ll try to do our maximum and see what it brings in the end. We need to do the best we can. Yes, I thought it was an F1 ad at first. But looking closer now those are obviously not F1 tyres (tarmac ad). It's an ad for the P Zero. My mistake. The legality of Ferrari’s hybrid system has been the subject of considerable debate, and F1 race director Charlie Whiting and other FIA representatives visited the Mercedes motorhome today to discuss power unit issues. I get that merc is running scared. But doing bs like calling the FIA to their motorhome is shameful even for them. I just hope that Todt remembers he was a Ferrari man for quite some time.